I Wonder Why ... ? SEATTLE, WA (N3) - Specially-trained police dogs have a long history of tracking bad guys on the lam, as well as sniffing out drugs and bombs. But now, K9s have a new job: locating cell phones in prisons. Cell phones are the new, hot contraband behind bars. Many states are even looking at jamming cell phone signals in prisons. But for now Washington state is putting its trust in two cell-phone sniffing dogs. KPLU's Austin Jenkins recently got to see the K9s in action. 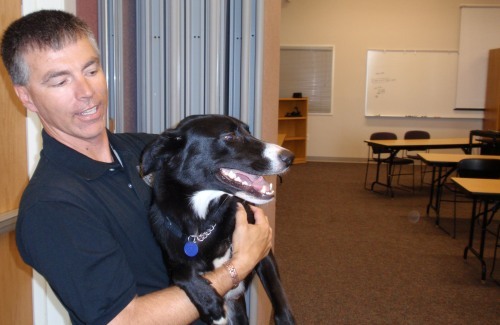 K-9 handler Murray Cox takes his black-and-white border collie Razor out of the back of his van. Murray Cox, K-9 Handler: "He's extremely cage protective, but he's only with strangers. Hey buddy." We're at the state prison in Monroe, Washington. Before doing a real search on the inside, Cox runs Razor - named for the Razor cell phone - through a simulation. Murray Cox, K-9 Handler: "You ready? Let's go find it." And with that Razor is off - sniffing high and low around the perimeter of a classroom in the prison's training center. Murray Cox, K-9 Handler: "What's up there? Oh good boy." It doesn't take long for Razor to alert on something. He immediately sits - a signal to his handler. Murray Cox, K-9 Handler: "He came across odor inside this fire extinguisher box and I stand back and wait for him to essentially work as far as he can without putting his nose directly on the item or without me opening up the cabinet." Sure enough inside the cabinet is a cell phone. Razor is one of two Washington Department of Corrections dogs trained in the last year to sniff out the electronic components in cell phones. Oregon is training its own cell-phone sniffing dog. Cell phones are a growing concern inside U-S prisons. A former Washington prison guard recently admitted to smuggling four phones into the state pen in Walla Walla. Cell phones can fetch as much as a thousand bucks on the prison black market. Once smuggled in they allow inmates to keep in touch with friends and family. But cell phones can also be used to coordinate drug deals, hatch escape plots, and even order murders on the outside. So far in Washington State only a handful of phones have been found. But prison officials like Dave Bustanoby at Monroe are certain there are more. Dave Bustanoby, Correctional Program Manager: "We know they're in here somewhere, but they're really tough unless somebody leaves their charger unattended or we happen to hear them ringing. But other than that they keep them pretty well secreted." Paula Lewis, K-9 Handler: "We've just arrived at the MSU - the Minimum Security Unit - at Monroe Correctional Complex." Paula Lewis is the second K-9 handler with the Washington Department of Corrections. She says this particular prison unit has been having problems with contraband. Paula Lewis, K-9 Handler: "So we're going to go in and hit one of the dorms and both dogs will work and we'll see what we come up with." Inside the dorm, there's a long row of beds. This is no military barracks. Beds aren't made, inmate belongings are strewn about. There are plenty of places to hide drugs, tobacco, cell phones - you name it. Lewis and her dog Jessie start on one end, while Murray Cox and Razor work the other. Paula Lewis, K-9 Handler: "Nice job. Good Girl. What's in here?" Both dogs are cross-trained to locate cell phones and drugs. They work fast and furious, sniffing every nook and cranny, even jumping up on the beds to get a better whiff. Soon Lewis notices Jessie senses something. Paula Lewis, K-9 Handler: "So the dog had a little bit of a change of behavior here. So I'm going to just get the dog in here a little closer. Up."